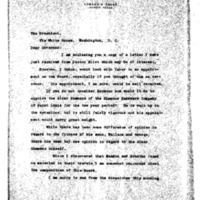 Edward M. House writes to Woodrow Wilson about appointing members to the Federal Reserve Board. I am enclosing you a copy of a letter I have just received from Doctor Eliot which may be of interest.Houston, I think, would look with favor to an appointment on the Board, especially if you thought of him as Governor. His appointment, I am sure, would be well received. If you do not consider Houston how would it do to appoint the elder Simmons of the Simmons Hardware Company of Saint Louis for the two year period? He is well up in the seventies, but is still fairly vigorous and his appointment would carry great weight. While there has been some difference of opinion in regard to the fitness of his sons, Wallace and George, there has been but one opinion in regard to the elder Simmons himself. Since I discovered that McAdoo and Houston found no material in their travels I am somewhat concerned about the composition of this Board. I am sorry to see from the dispatches this morning that you have another cold, and it makes me wish that you could come to Texas and be with us here for awhile. House, Edward Mandell, 1858-1938, “Colonel House to Woodrow Wilson,” 1914 February 13, WWP18352, First Year Wilson Papers, Woodrow Wilson Presidential Library & Museum, Staunton, Virginia.